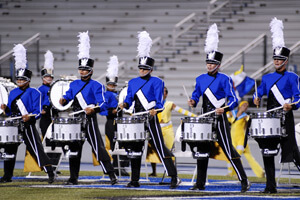 The Blue Devils kept their undefeated streak intact Friday, July 24, after the completion of the second day of competition at the Pearl Presents the Masters of the Summer Music Games event in Murfreesboro, Tenn. 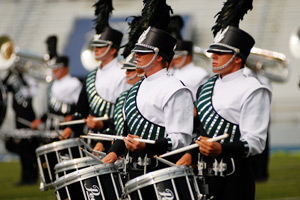 Earning a score of 93.200 – the highest of any corps to date – the Devils came out on top in every adjudication caption and sub caption, less General Effect Music. Of the corps notable success this year, Blue Devils color guard captain Corey Oliver said, "There's been a lot of energy on the field and we've gotten a very good response from the audiences which is always an easy thing for us to feed off of." "At this point in the season, we all realize that we need to keep pushing, and pushing, and pushing, because the time before the end of the season is getting limited," Oliver said. "We all know and have experienced that anything can happen at the end, and it's never just in your hands, so you've always got to work for what you want." The Holy Name Cadets took second place at the event hosted at Middle Tennessee State University's Floyd Stadium. The judges awarded the group a score of 91.650. What set this particular night apart from others for Cadets color guard caption Ashley Pittman, was the liveliness of the corps' performance. "The energy was overwhelming, and because of that, we had such a fun performance tonight. Hopefully the rest of the season is like that." The Bluecoats held tough in third place with a score of 87.000, followed by the creeping Phantom Regiment (86.050) who pushed themselves into fourth place. After a rough start to the 2009 season for the defending World Championships, finishing as low as eighth place at a previous event, Phantom is showing signs that things are beginning to solidify for the corps while heading into the final weeks of the season. The beginning of a slow and steady climb back into higher placements looks to be due, in part, to a major redesign of the corps' 2009 production, "The Red Violin." "Things weren't quite working out which led to a lot of changes with our production," said Phantom Regiment conductor Koji Mori. He says that in just a matter of days, the group has revised about five-and-a-half minutes of an approximately 12-minute production. "Once we got the new changes, everyone felt like we could really start buying into this program," said Mori. "The next week is going to be very exciting as we continue to fine tune the show even more." Earlier in the day, the Boston Crusaders (5th, 85.450) shared their time and staff with students who attended a Live Learning Event before the competition began. 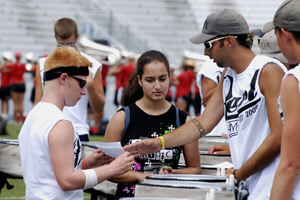 Breaking out into separate brass, color guard and percussion sectionals, the Crusaders staff went through a variety of basic and intermediate techniques aimed at showing students skills that they could utilize in their own marching band programs and other musical ensembles. "For me, education comes before competition," said DCI Hall of Fame member and Boston Crusaders brass staffer Frank Williams who led the corps through several exercises during the event. "It's about building that bridge to the next generation of drum corps members and teachers … Education and making sure that this tradition continues – that's something we can really do something about." Back in the game, the Glassmen placed behind the Boston Crusaders in sixth (84.100). Glassmen members have been recovering from an illness that spread through the corps' ranks this week. After pulling out of an event in Hattiesburg, Miss. to take some much needed rest, the corps stayed stationary for a couple more days in Huntsville, Ala. to recover and rehearse. "The bug that we had, as we were told, was some kind of 36-hour deal, so a lot of those kids have been coming out of that over the last 12 hours," said Glassmen executive director Brian Hickman. 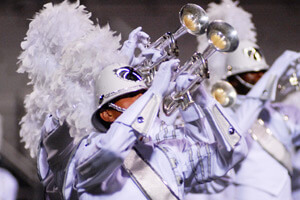 Resilient and ready to go, all members were able to take the field with the corps to perform in Murfreesboro. "Did we push them to get back in? Absolutely not," said Hickman. "We let them in as they were comfortable enough to be in rehearsal today, and if they weren't comfortable, we put them back to bed and then played it by ear. Fortunately they were all in, and that was all about them feeling good enough to do that." The Academy (7th, 80.050) continued its push up the middle of the pack, followed by Crossmen (8th, 78.500), Mandarins (9th, 76.200), Pioneer (10th, 71.900) and Cascades (11th, 71.350).